-Build a light rail or other rapid transit along major corridors like King George Boulevard, 104th Avenue, Highway 1 and Fraser Highway. -Investigate using the Interurban Corridor for inter-regional service to Abbotsford and Chilliwack. -Consider a 200th St. streetcar to service present and future density in Langley. -Consider a Downtown Langley streetcar that will connect residences to shopping and amenities. -Consider a Cloverdale and Abbotsford streetcar to provide connecting service to the Interurban, and promote Transit Oriented Developments. -Use transportation demand management and the latest technology to ensure that bus service is reliable and fast. -Improve local bus service and the frequent (every 15 min.) bus network in the South Fraser. -Build more Transit Oriented Developments (TOD's). 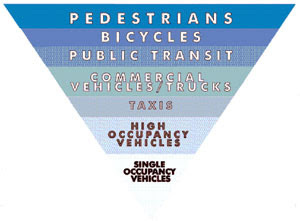 -Promote land use planning and transportation planning that fits together. -Look at road pricing that will help reduce congestion on our major roads to ensure that goods and people move through our region. -Build complete roads that would allow for and support equal access to all modes of transportation such as walking, cycling, transit/trains and driving. 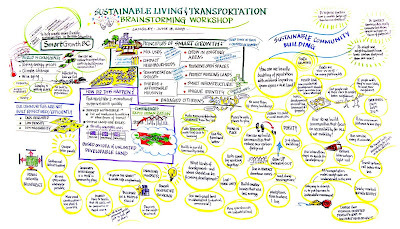 On June 18, 2008, South Fraser OnTrax hosted a sustainable design and brainstorming workshop. It was a public event that was attended by young and old participants from Vancouver to Abbotsford. The group absorbed presentations about building sustainable communities and transportation systems, then participated in two interactive group brainstorming exercises that centered on the South Fraser region. 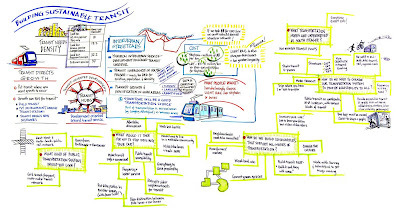 With the help of a graphic facilitator, everyone's input and thoughts were captured through drawings and mind-maps. The impressive brainstorming maps are featured below. Click on the drawings to open up a larger version.